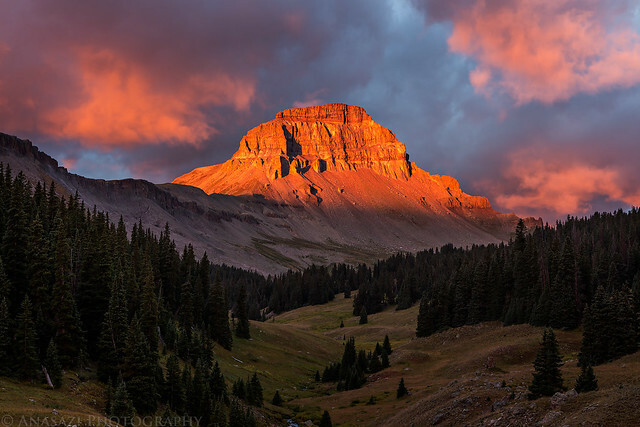 An incredible Labor Day sunrise below Uncompahgre Peak. 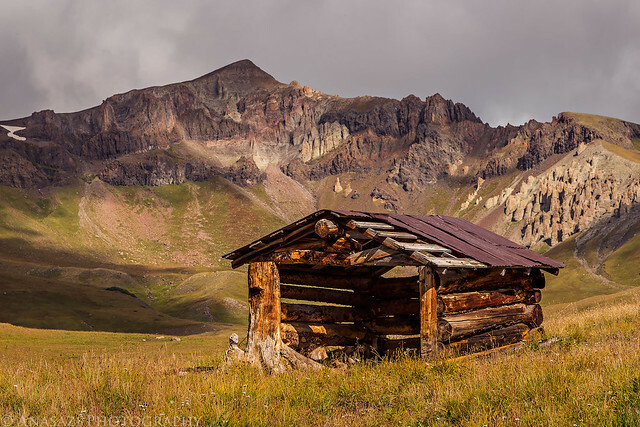 This year for the long Labor Day weekend I wanted to go on another backpacking trip into the Uncompahgre Wilderness of Colorado’s San Juan Mountains, but I also wanted to go somewhere that was unlikely to be crowded since this is probably one of the busiest camping weekends of the year. 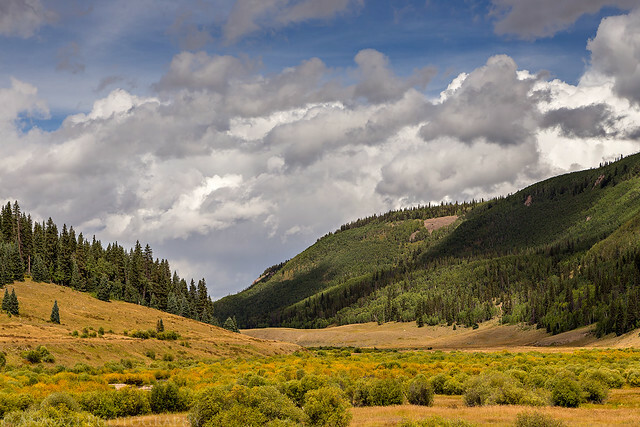 After some research I selected the Big Blue Creek drainage as our destination. 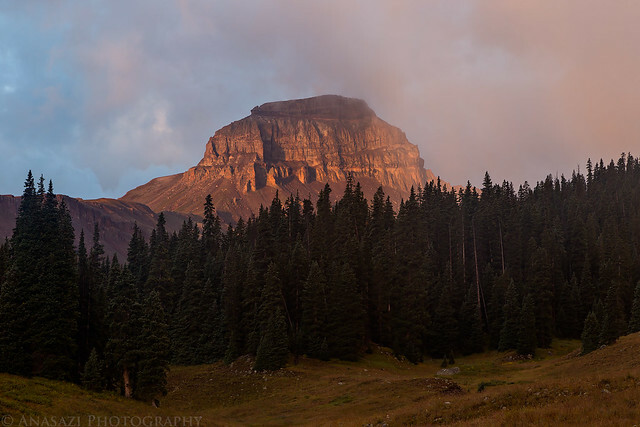 Not only was there very little information about this area online and in guides, which hopefully meant it wouldn’t be very crowded, but I was also hoping to photograph the north face of Uncompahgre Peak (14,309) at sunrise since I hadn’t seen too many photos of this massive mountain from that side. 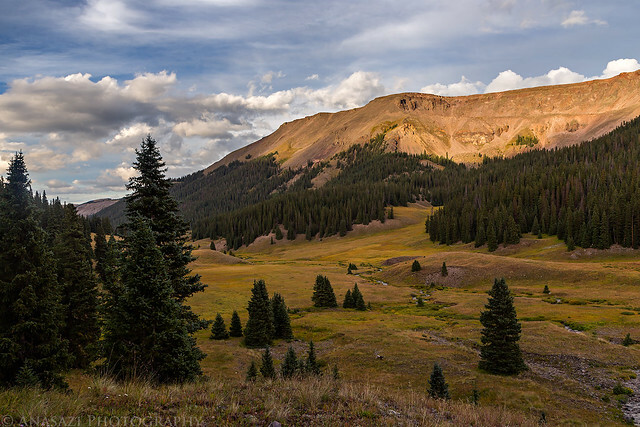 I had originally thought about connecting the Fall Creek and Failes Creek trails to create a big loop hike but changed that idea so that I would be able to spend two mornings photographing Uncompahgre Peak to help improve my chances of catching a great sunrise. This strategy paid off well as you can see from the opening photo above. 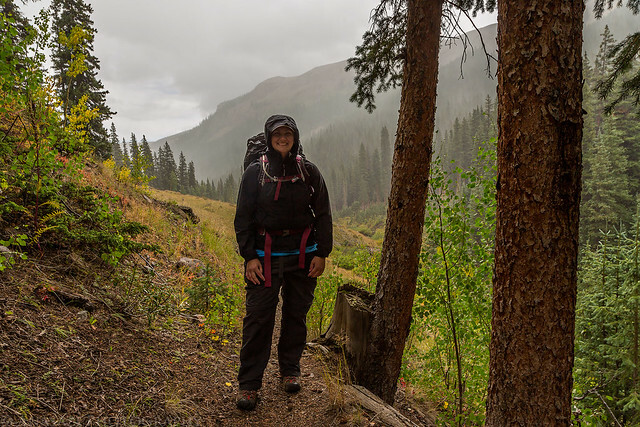 We were all set to leave after work on Friday and spend the night near the trailhead, but with storms moving through the area overnight we changed those plans last minute. Instead, we stayed home Friday night and left early on Saturday morning. 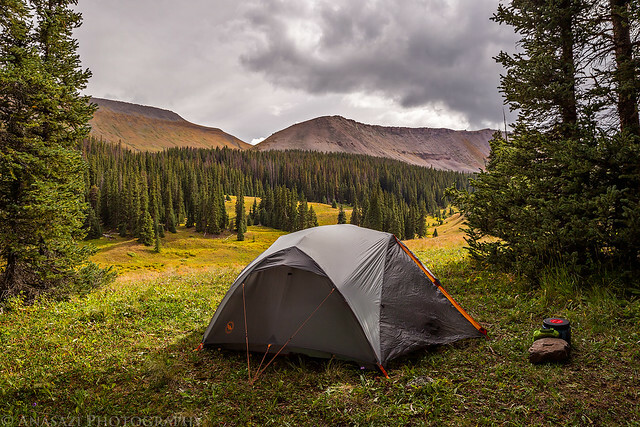 It seemed to be a good decision since we had a few big storms roll through overnight and we didn’t really want to deal with a wet tent in the morning. After driving through Delta and Montrose and over the Cerro Summit, we turned off of Highway 50 to follow the Alpine Plateau Road to the trailhead. 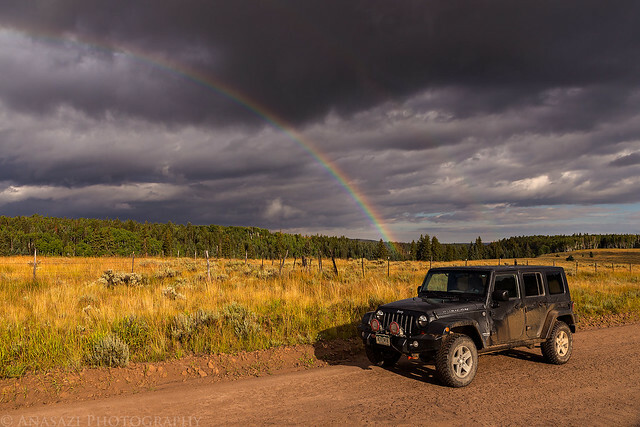 We caught this nice rainbow as we drove along the Alpine Plateau Road. I had to stop for a photo with my Jeep. 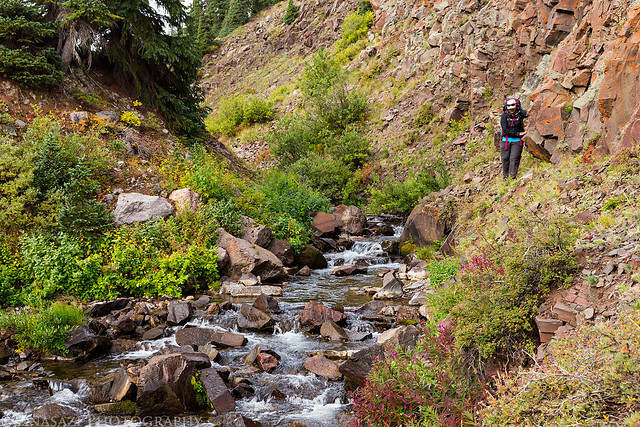 Following Soldier Creek to the trailhead. 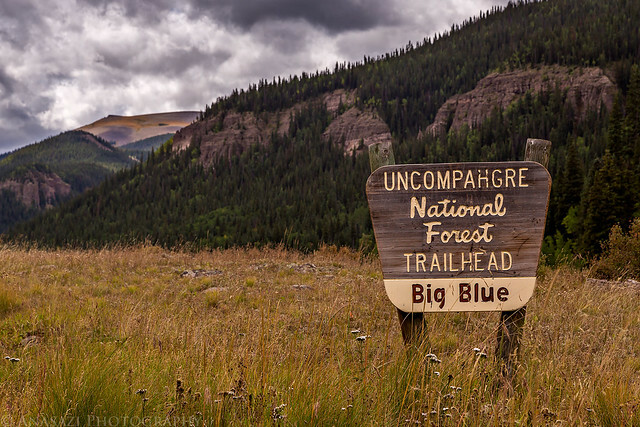 After driving dirt roads for a little under an hour, we finally reached the Big Blue Trailhead. There were no other cars in the parking area when we arrived which was a good sign that we would be able to find some solitude in this area even on one of the busiest camping weekends of the year. 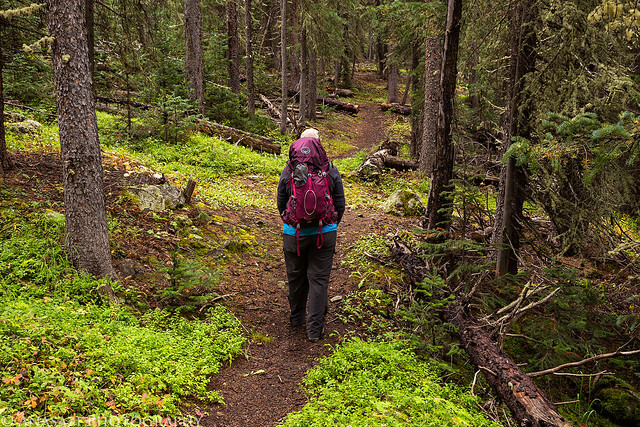 We got our packs ready and started hiking up the trail along Big Blue Creek. 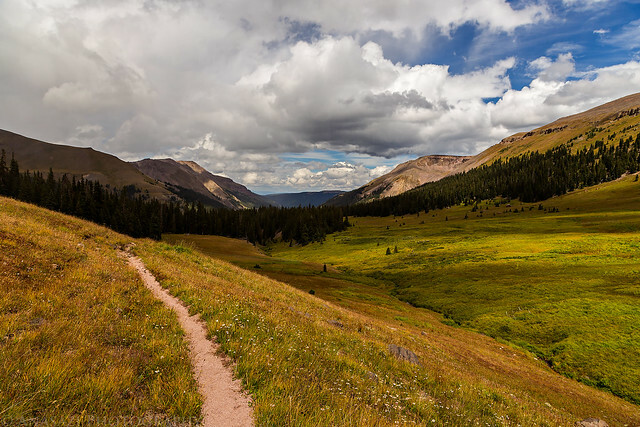 The first few miles of the trail follows the forested slopes of the valley and doesn’t offer much of a view until you reach the upper portion of the drainage. I was hiking out in front most of the day and was constantly walking through spider webs that were strung across the trail. It was a little annoying but also a good sign that no one had been through here recently. When we first started hiking there seemed to be quite a few mosquitoes around, but they didn’t really bother us as long as we kept moving. As we hiked higher into the valley they seemed to disappear. We stopped at Slide Lake for lunch and to rest our feet, which turned out to be about the halfway point of our hike for the day. I was hoping to take some photos at the lake but was disappointed to find it was not really much of a lake. 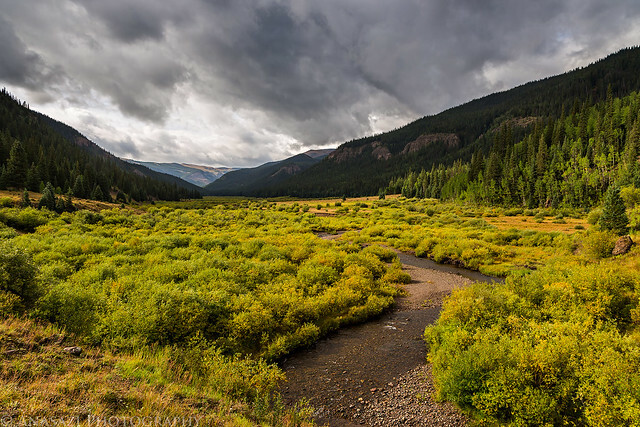 Threatening skies over Big Blue Creek near the beginning of the trail. 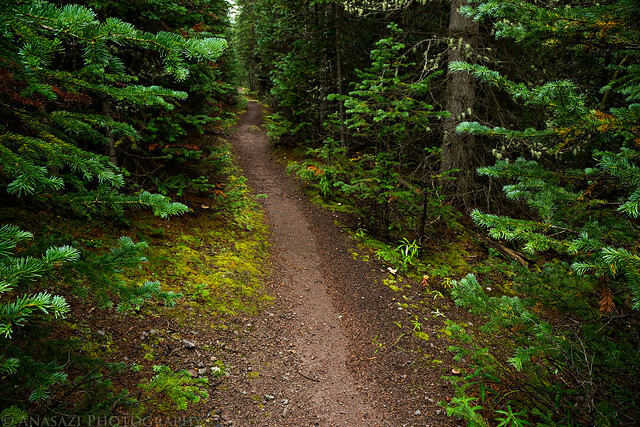 Much of the lower trail was through the forest like this. 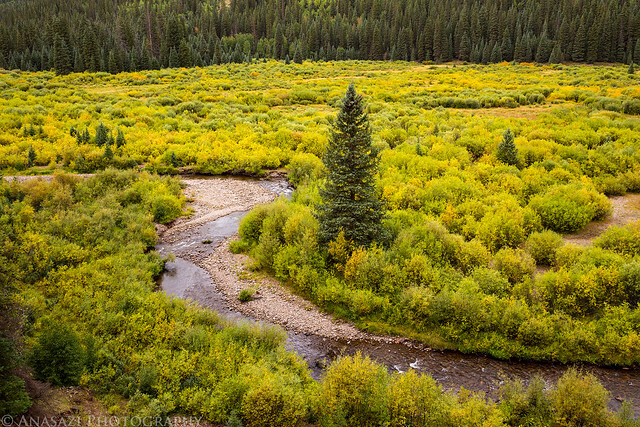 We could definitely see the beginning of fall approaching with some aspen leaves already starting to change color. 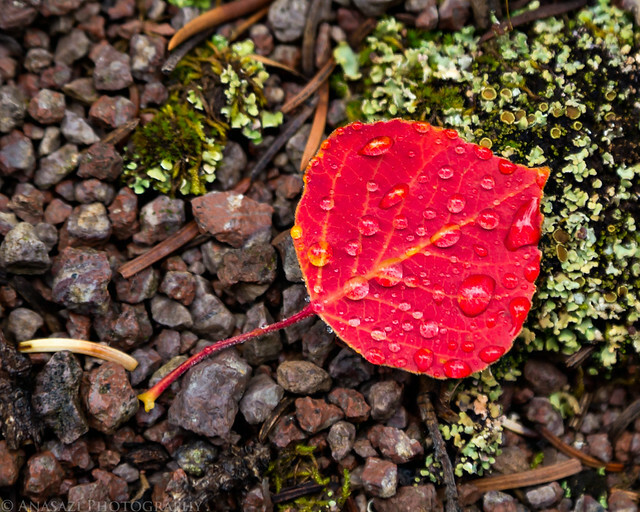 Besides the typical yellow, we also found many black and red leaves along the trail. Diane hiking up the trail ahead of me. We had to put on our rain gear for a little while when it started to rain. Luckily it didn’t last very long. We would encounter a few other sprinkles throughout the day and evening, but nothing that would get us soaked. 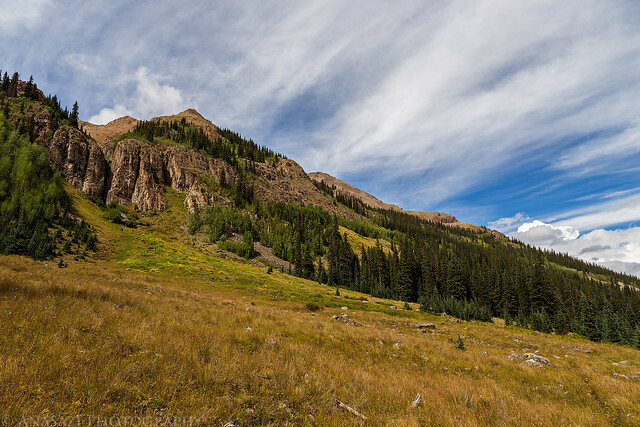 As we hiked higher into the valley the trees opened up a little and we started to get better views around us- like this view of Unnamed 13016 (13,016) above the trail. After hiking a little over 9 miles and climbing over 1,500 feet we found a nice campsite that we would be calling ‘home’ for the next two nights. After camp was setup we had dinner and explored the area a bit. I had hoped to photograph sunset from near camp somewhere but the sky was pretty much overcast this evening. Shortly before the official sunset it started to rain, so I headed into the tent for the night and went to sleep early. It would rain on and off for most of the night but had stopped by the time my alarm went off for sunrise. I got out of the wet tent to try and take some photos nearby. Unfortunately, sunrise was mostly a bust for me this morning. Not only was it still pretty cloudy out, but the humidity from all the rain overnight and the cooler temperatures caused my lens to keep fogging up no matter how many times I wiped it off. 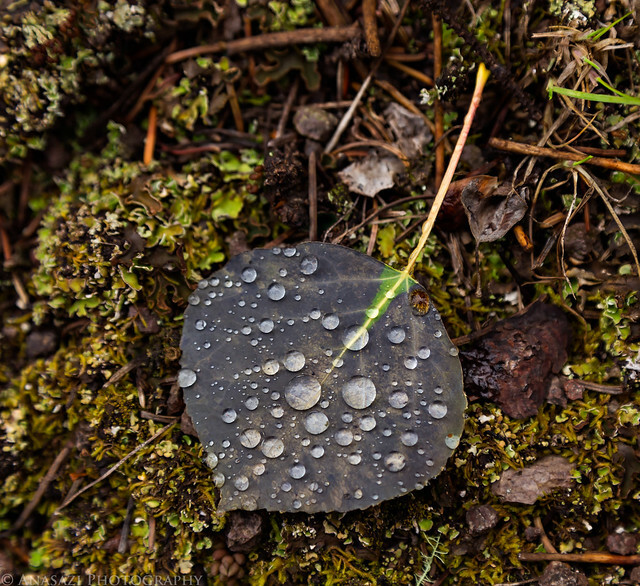 As soon as I would wipe off the condensation it would fog up almost instantly again, so most of the photos I did take were ruined. 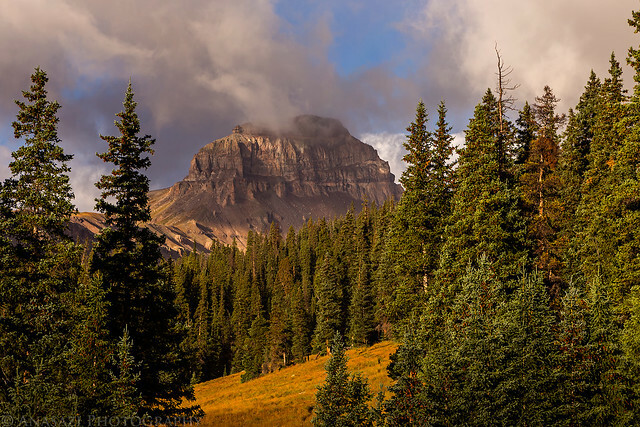 Here is one photo I managed to get of Uncompahgre Peak breaking free of the clouds that wasn’t ruined by condensation. 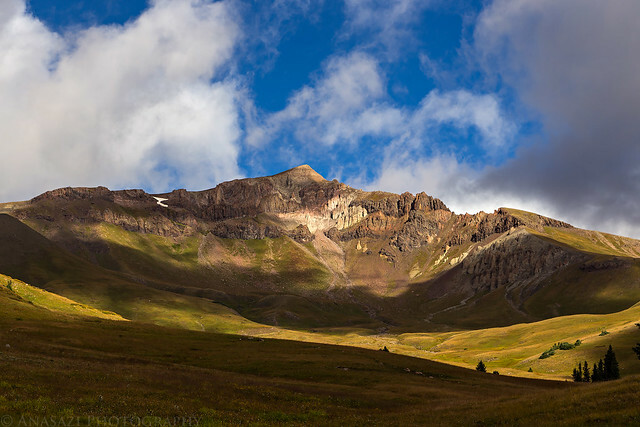 A view of Uncompahgre Peak from our camp taken a little bit later. The low clouds would play hike-and-seek with the peak for much of the morning. 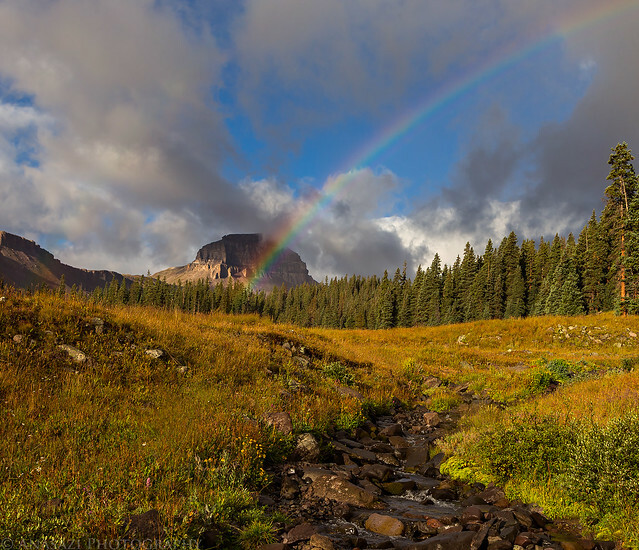 Soon it started to rain lightly and the second rainbow of our trip appeared right in front of Uncompahgre Peak. 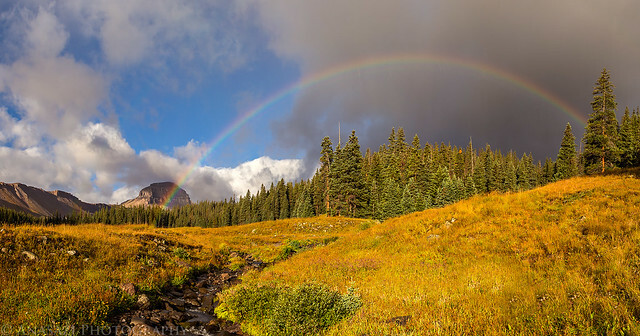 Here’s a panorama of the entire rainbow. Our campsite is located just to the right out of the frame. 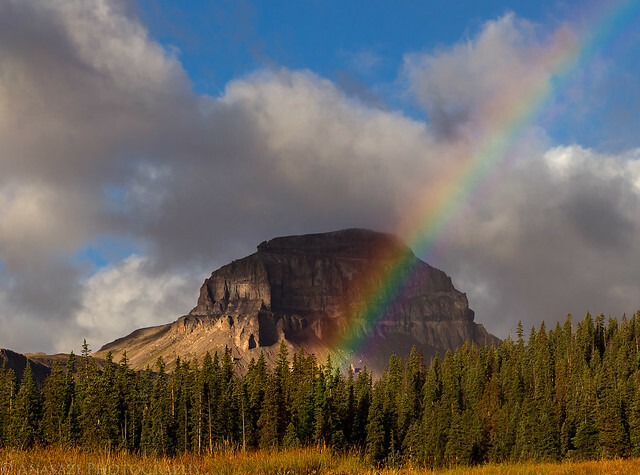 After the rainbow had disappeared and the rain had stopped we headed out to hike the Fall Creek Trail to the pass between Silver Mountain and Unnamed 13051. I planned to climb Unnamed 13051 while I was up there. Diane enjoying the view after the rain had stopped. 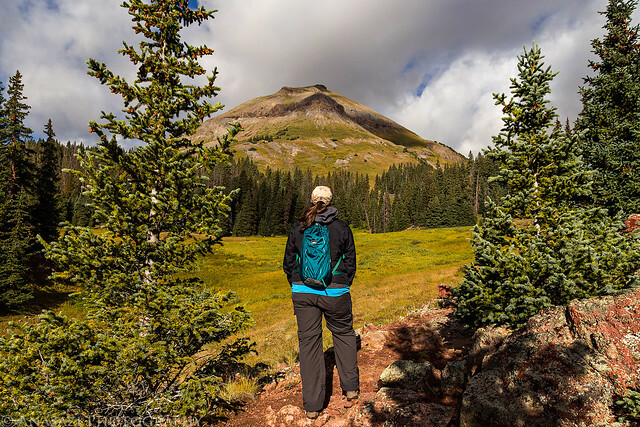 Diane hiking up the Fall Creek Trail with a false summit of Big Blue Peak (13,467) in front of her. 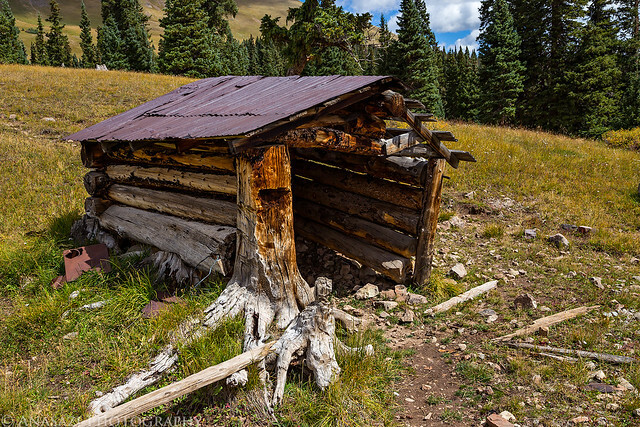 After climbing above treeline we came across this little shack below Silver Mountain (13,714). Diane decided to wait here while I climbed up to the pass and summit. 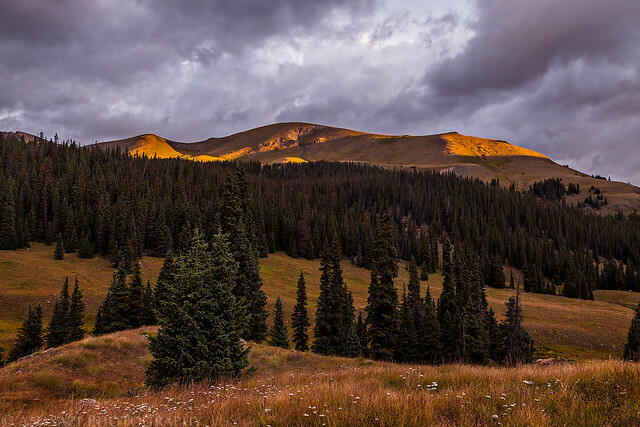 Light show on Silver Mountain as I hiked up the basin to the pass out of the frame on the right. 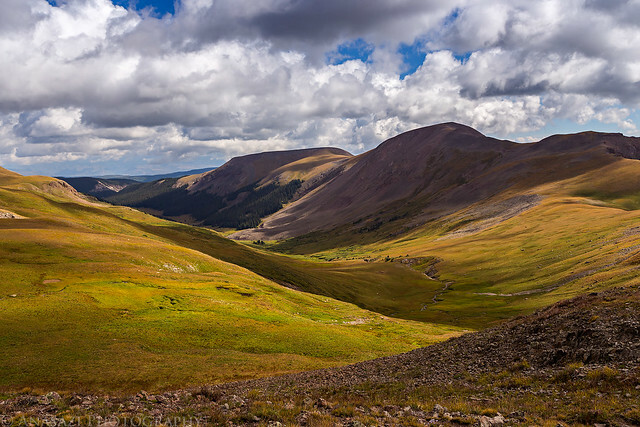 View from the pass into Fall Creek with Unnamed 13016 just right of the center. 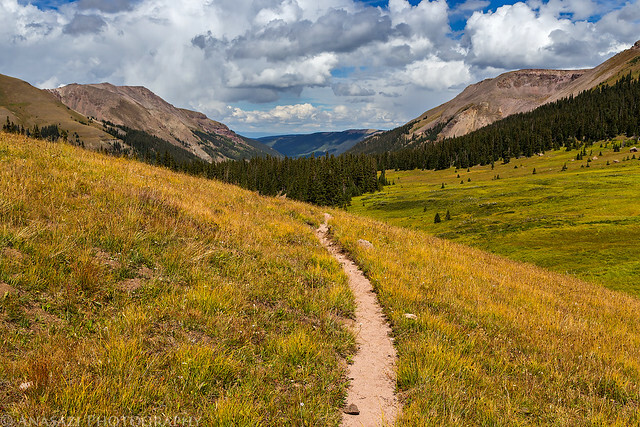 Nice views up here looking towards the Little Cimarron Trail. From the pass I followed the rounded ridge to the top of Unnamed 13051. 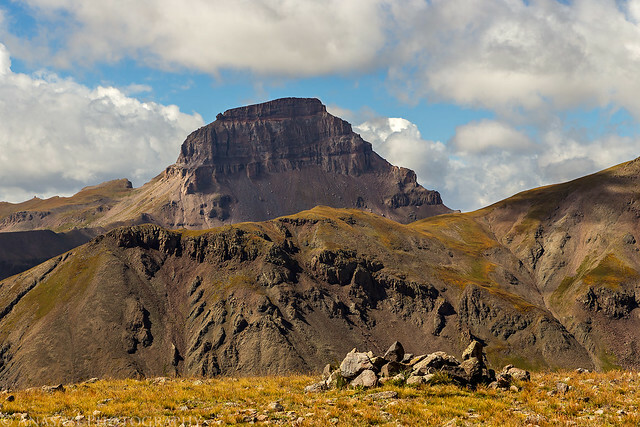 Uncompahgre Peak came into view to the left of Big Blue Peak as I hiked higher. 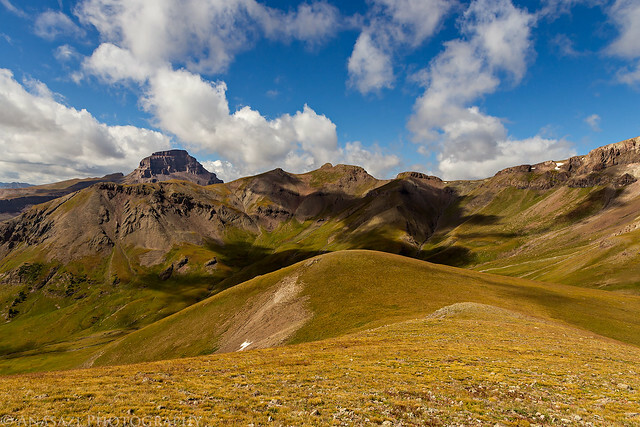 View from the summit of Unnamed 13051 with Uncompahgre Peak in the background. When I returned back to the shack I noticed the unusual construction of using an existing tree stump as one of the main corner supports. Very interesting and something I have not seen before. 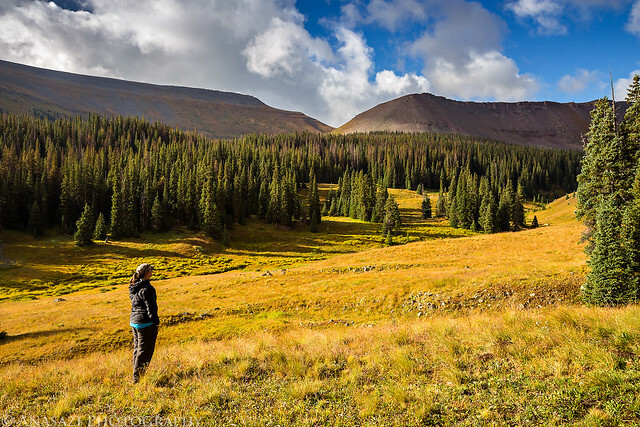 After hiking back down to the intersection near our camp it was still early so we decided to hike up the rest of the Big Blue Trail to the Ridge Stock Driveway above Nellie Creek. It was on this short hike that we would run into the only people we would see the entire weekend until we were heading back out to the trailhead on Monday morning. We came across a trio of bow hunters who were out looking for elk. They were camping out here for a few weeks and were as surprised to see us as we were to see them! 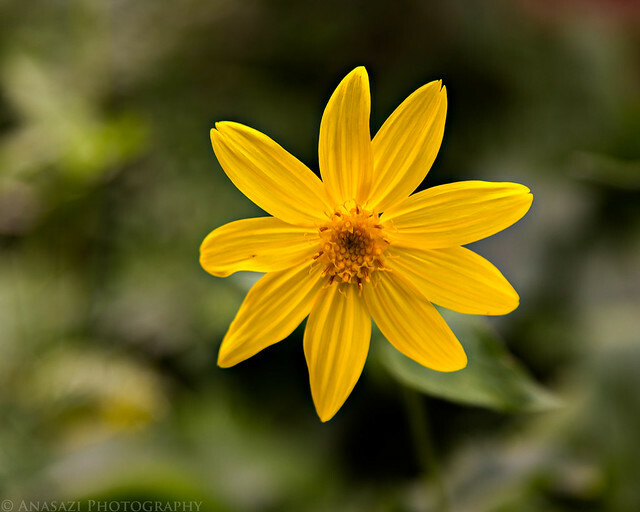 Even with the fall colors beginning to show, there were still some leftover wildflowers around. 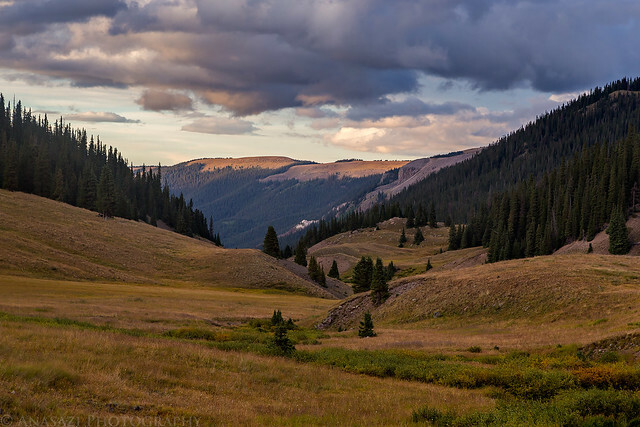 View back into the Big Blue Creek valley as I hiked up to the Ridge Stock Driveway intersection. 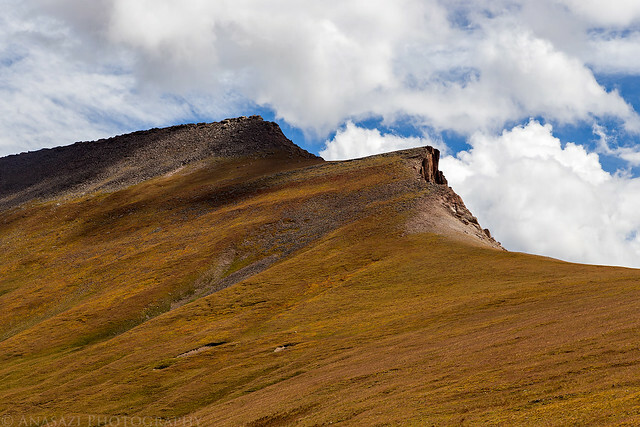 To the left of the pass was Unnamed 13106 (13,106) which I was tempted to climb. However, my legs were starting to feel a little tired, so I decided to save it for another day. 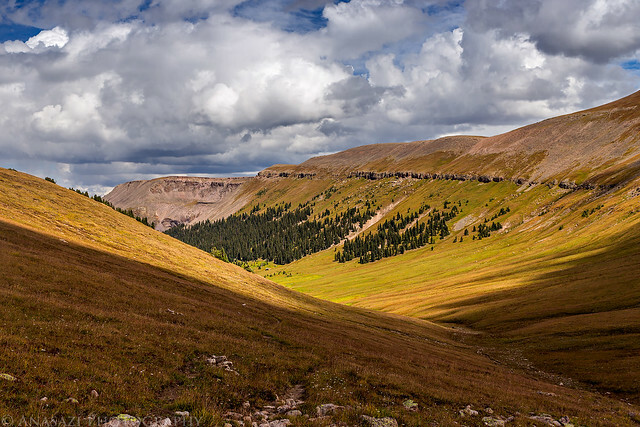 It will be an easy hike from the Nellie Creek Trailhead in the future. The junction with the Ridge Stock Driveway trail. 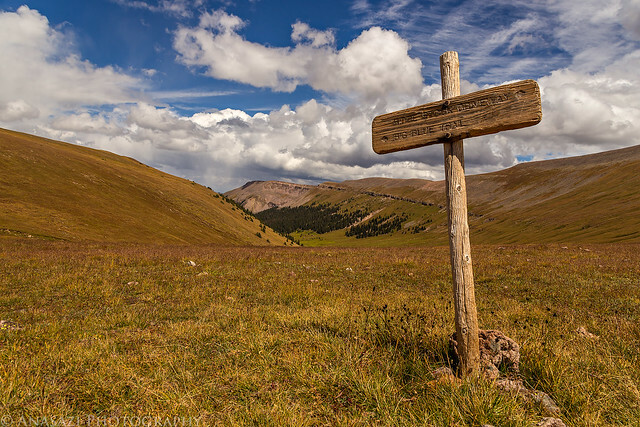 The trails aren’t very defined up here, so you need to keep an eye out for posts, cairns and the occasional sign. Returning to camp for the evening. 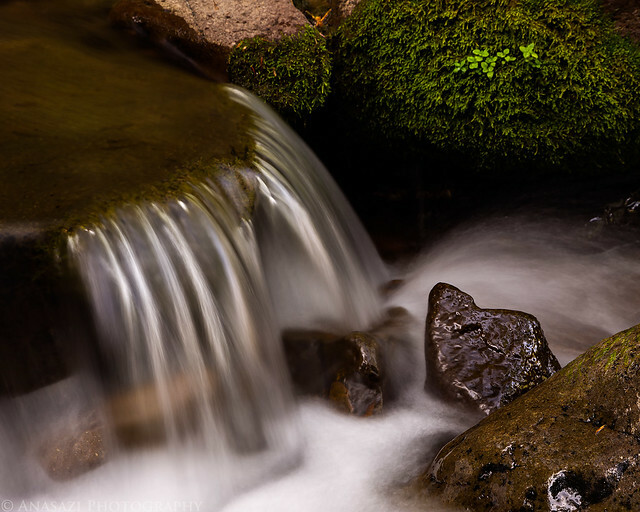 While getting water from the stream near our camp I noticed a few small cascades that were interesting, so I brought over my camera and tripod for a few shots. On Monday morning I woke up about an hour before sunrise and hiked over to an area I had scouted out the previous day to photograph from. 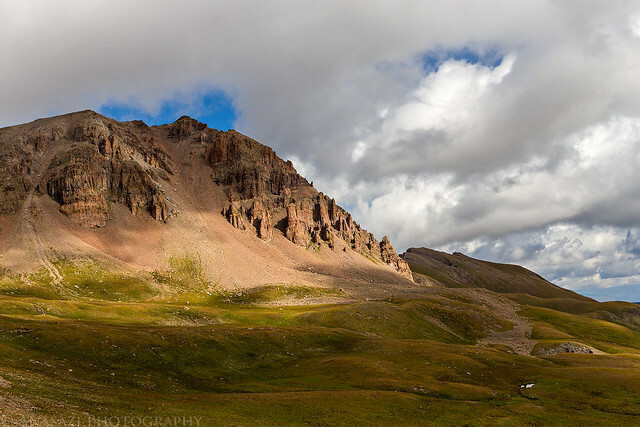 This area offered a great view of Uncompahgre Peak above Big Blue Creek. I was hoping for an amazing sunrise and I wouldn’t be let down! 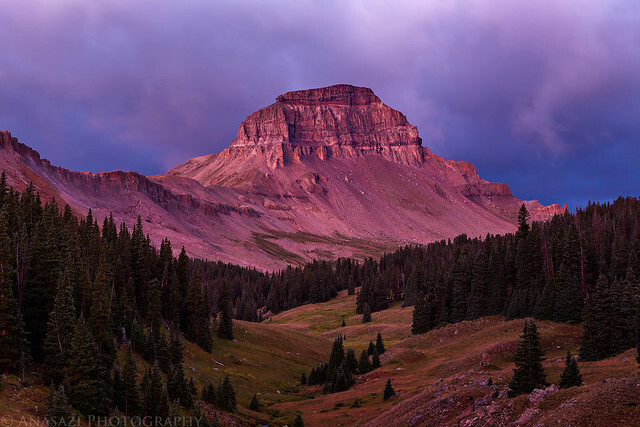 The alpenglow this morning was very intense with the early light of dawn bouncing off clouds to the east and casting a strong magenta hue across the landscape. 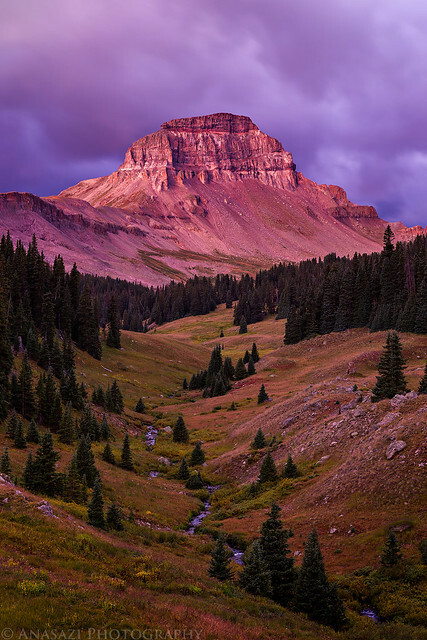 Big Blue Creek leads the eye to Uncompahgre Peak. 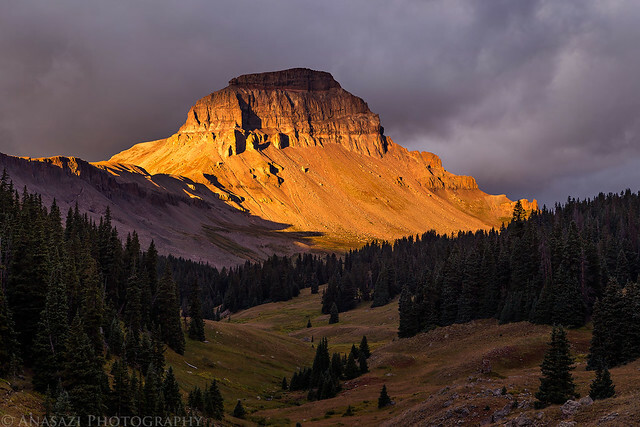 When the sun broke free of the horizon, it really lit up Uncompahgre with some intense color! It only lasted a minute or two before fading, but the show was spectacular! A few minutes later the color was gone but warm golden light was still getting through the clouds. After this the clouds would overtake the sun and we wouldn’t see it again for a while. Looking back the other direction to the light on Unnamed 13051. If you look for a little white spot on the right in front of the trees, that’s out tent. 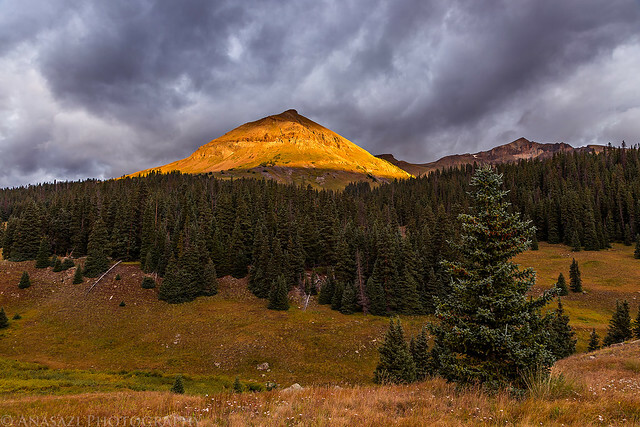 Spotlight on a false summit of Big Blue Peak. When the light was gone I returned to camp and we packed everything up so we could start hiking back to the trailhead. We had over 9 miles to hike and were hoping to make good time since it was mostly downhill. 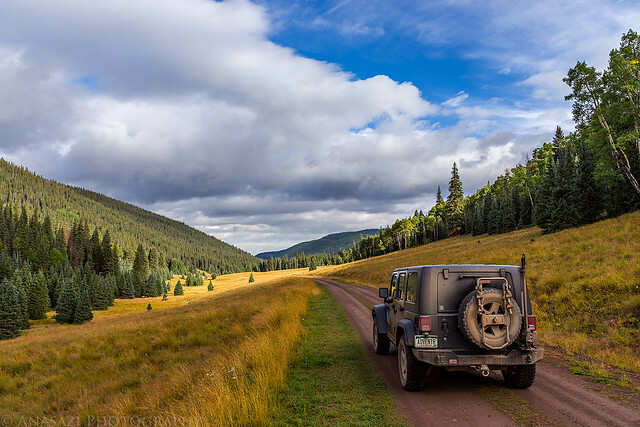 We ended up making it back to my Jeep in under 4 hours which included another short break at Slide Lake. Trying to avoid a deep water crossing early in the morning we took an alternate route that was a little tricky. 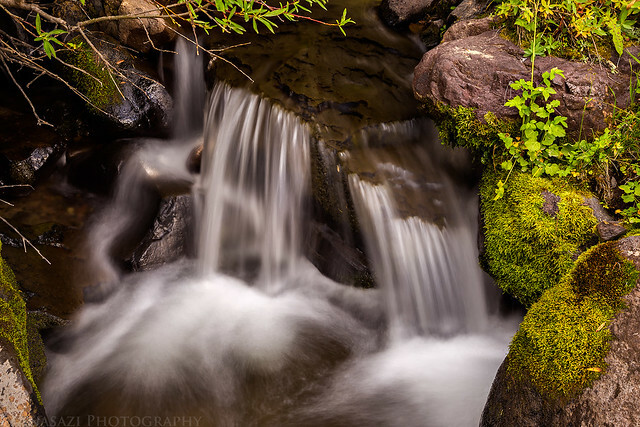 A bend in Big Blue Creek. A parting shot as we left Big Blue Creek behind and started the drive back home. Just one last photo of Uncompahgre Peak before sunrise on Labor Day to finish off the trip report. Since there doesn’t seem to be much information about this trail available (that I could find), I’m including a map below with the GPS tracks from our hike.